I’m sure that enough has already been written and said about the march vote of the NH legislature to deny the request of a 4th grade class to have the red-tailed hawk named NH’s official raptor, But I’ve got a stake in this. First of all, the red-tailed hawk has been the official raptor in the Broussard home ever since my kids were in elementary school. For a number of presidential cycles, the Concord school district hosted their Hawk Convention where students made campaign materials to get out the vote for their favorite birds of prey. I’ve still got some hand-drawn posters of Red in the attic, along with other too-precious-to-ditch school projects. He had my vote then and still does. 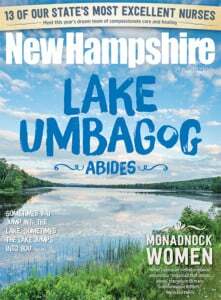 Professionally speaking, this magazine has a long relationship with an “official” state creature that, while not as fierce as a raptor, gained its status only after lobbying by a group of NH school kids. The red-spotted newt is the state’s official amphibian thanks to an eager class of junior high students and a dedicated teacher named Phil Browne. I loved the story of their campaign and the colorful persona of the newt so much I lobbied (and won) my attempt to make it this magazine’s official mascot. We even devised a fun game to announce the partnership and now each month we get scores of love notes to Spot (as we have affectionately named him) in our Spot the Newt contest (see rules on page 7). But I’m not writing to second-guess the Legislature or breast beat about how rudely a bright-eyed squadron of youngsters was treated. In fact, I’m writing in defense of the peculiar culture of our Statehouse and the unique political ecosystem that makes it possible. After all, Representative Warren Groen (vilified by everyone from HuffPo to John Oliver) was correct about the behavior of the red-tailed hawk. They do swoop in and make short work of small mammals with their razor-sharp beak and claws. And NH has a minor league baseball team named in honor of a weasel-like creature most famous for keeping the neighborhood cat population in check (go, Fisher Cats!). We even love our blood-sucking pests so much that we have named a whole season after them (hello, black flies). In his epic requiem, poet Alfred Lord Tennyson described nature as a bloody thing: “red in tooth and claw.” And most children raised on teddy bears and plush purple dinosaurs first encounter adulthood by assimilating the lesson that the animal friends that live in surrounding woods and fields are usually preoccupied with killing and eating one another. Politics differs from Mother Nature in many ways, but it’s also the focal point of one of her specific categories: human nature. As confounding and disheartening as it can be to witness some of the worst qualities of people on official display in accordance with Robert’s Rules of Order, there are such lesson that we all must learn, sooner or later. Our state’s Legislature is not like the well-groomed political zoos and upscale habitats where most states pass their laws. With 400 members each paid $50 a year, it’s the real deal — the political forest primeval. So when you take a group of kids on a hike through its tangles and trails, be warned — you never know what they may learn.